Well this isn’t something that you see Apple do every day. According to Macrumors, the company prematurely posted several images of a new LED display on its site, with the part number MC914. This part number had been previously ascribed to new MAcBook models. 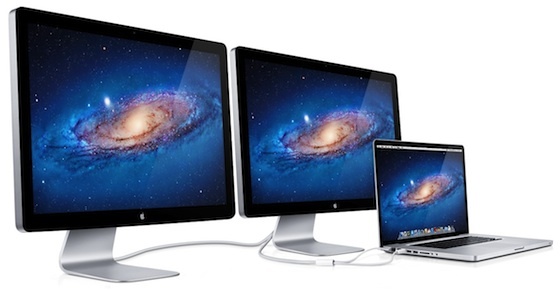 The new display is also shown to have a Thunderbolt port in other images on Apple’s site. The new LED display looks almost identical to the existing LED Cinema Display, although the promotional images on the site show it off with the default Lion background, not the older Snow Leopard one. This indicates that they may be released along with OS X Lion, whenever that happens. While the display looks almost identical to existing ones, there are definitely some changes on the rear of the monitor, as some images depict a Thunderbolt cable snaking out from the back, an option the current monitors don’t have. In one particularly interesting case, the promo image shows a MacBook daisy-chaining two of these new monitors through the use of its Thunderbolt port, a feature that Apple had touted at the release of the new standard. Only the current 15 and 17-inch models of MacBook are equipped with Thunderbolt. 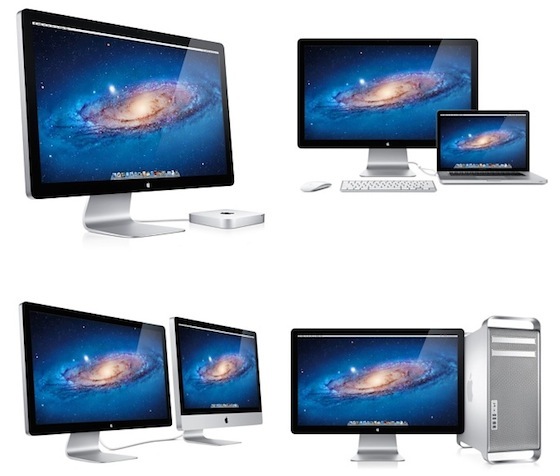 Because of the new connection method, the images also seem to indicate new models of Mac Mini and Mac Pro, as they are being shown alongside these in the images, although they could simply be existing models connected via a standard Display Port connector, if the new LED displays supported the older standard as well.